Born in Redditch, Worcestershire Alan began painting as a small child with brushes made from his mother’s hair. It was this interest that took him away from the monochrome grime of the town into a landscape where he could create his own sense of order. He recalls an early memory of sitting low down on the edge of a barley field drawing the shapes of the plants displayed against a blue sky and feeling the intense joy of being out in the natural world. After attending the local Grammar School he went on to Redditch and Bournville Schools of Art. He then joined the Painting School of Birmingham College of Art and then on to the University of Birmingham. 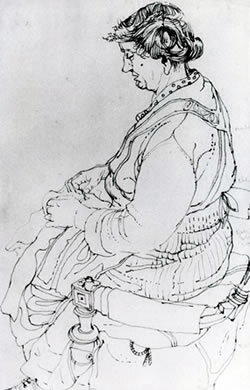 In the late 1970s he did research at the University of Exeter and for some years was Senior Lecturer in Painting and Art History at Rolle College, Exmouth, from where he resigned in 1982. 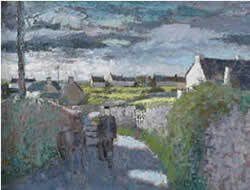 Although having painted since he was a boy he felt that, even with four children at home he wanted to follow his passion and paint full time and persuaded his wife to give up her full time teaching job at the same time to start a freelance life. After leaving college he went to teach at Lydney School of Art near the Severn Estuary and he and his new wife Tricia bought two miners cottages which they converted and built a studio on the end. 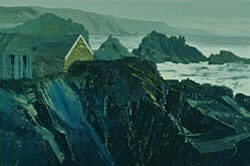 In the late sixties he moved to Devon and there began a series of large paintings of the Hartland Coastline in North Devon many of which have found their way into public collections. When Alan first came to East Devon he fell in love with the area and did many paintings along the River Otter and of the surrounding valley. It was here that Alan built his present house, studio and gardens, which have been developed over the years in the village of Colaton Raleigh in East Devon. He has contributed much of his time over the last few years to the arts of the South West and was a founder member of the South West Academy of Fine & Applied Arts, together with artists Graham and Annie Ovenden, Michael Morgan and the late Brian Bearne. He was the Academy's President for its first six years. Alan has served on many committees including the Fine Art Committee of the University of Exeter, the Devon Arts Forum and on the Board of the Exeter Phoenix Arts Centre. 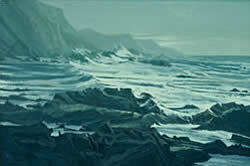 He is also Patron and President of a number of art groups around the South West. He is a member of the Chelsea Arts Club and the Arts Club in Dover Street. He has worked for a number of charities over the years, including Peace One Day and Children's Hospice South West which are dear to his heart.